MRA | Baltimore Metro Reservoir Anglers, Inc.
My biggest fish come from using a ? Waino Anderson and Ron Wolfe claim the 2018 Anglers Of the Year on total weight tie breaker. 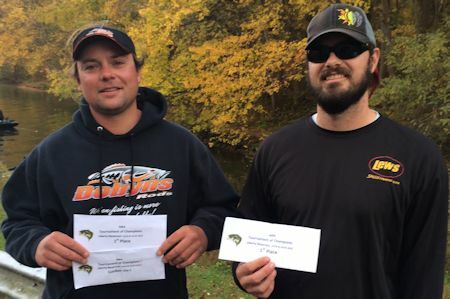 Craig Gordon and Holden Wolfe claim the 2018 Tournament of Champions held at Liberty Reservoir on 10/27-10/28. Chad Wisner and Lenny Wisner claim the 2017 Anglers Of the Year with win on last tournament of the year. The team of Chad Wisner and Lenny Wisner claimed the victory with a two day total of 38.19 Lbs. 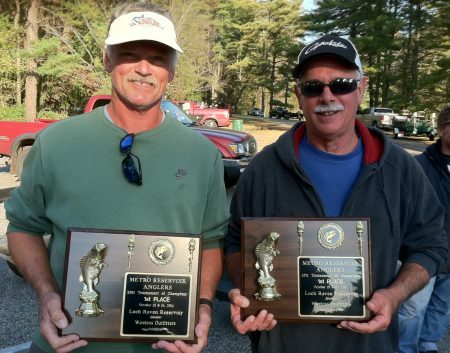 Rob Bertazon and Ron Broadwater 4-peat as Anglers Of the Year winning with the best year in club history. 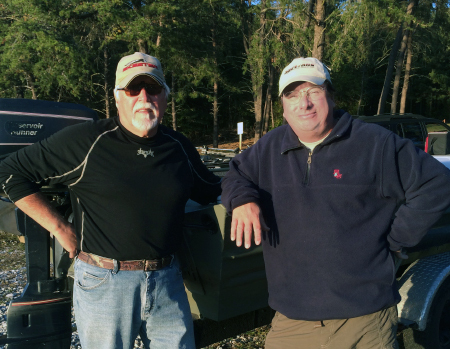 The team of Rob Bertazon and Ron Broadwater claimed the victory with a total of 25.04 Lbs. of Prettyboy bass. 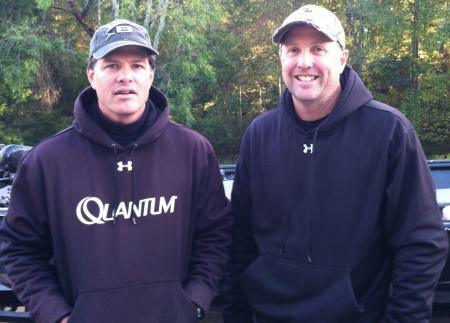 Rob Bertazon and Ron Broadwater 3-peat as Anglers Of the Year winning for the 2nd time by virtue of the tie-breaker rule. With 2-day weight of 32.97 lbs. including the biggest single day bag (18.18 lbs) and tournament lunker (5.67 lbs) Elliott and Rini won the 2015 TOC on a surprisingly stingy Liberty Reservoir. 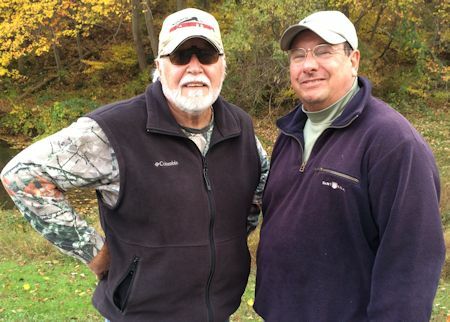 Ending the year with an unprecedented 3 tournament wins in a row, Rob Bertazon and Ron Broadwater repeat as Anglers Of the Year. After finishing 2nd in the prior two TOCs, Craig Gordon and Holden Wolfe took home the trophy by weighing an impressive Day 2 bag of fish (the only limit of the tournament) of 21.61 lbs. This added to their 8.42 lbs. Day 1 gave them 30.03 lbs. to cap a huge comeback. 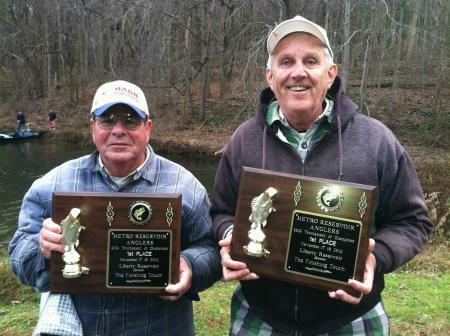 Rob Bertazon and Ron Broadwater claim the 2013 AOY title with a 2nd place finish in the last regular season tournament. 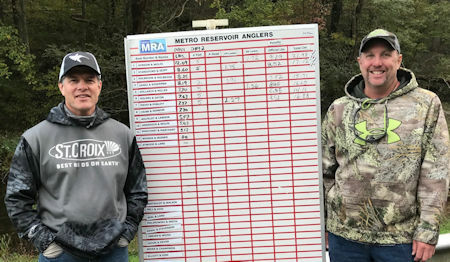 On 2 tough days at Prettboy Reservoir, Rob Bertazon and Ron Broadwater rode their big first day lead and both daily heaviest bags to a win easily out distancing competitors. Craig Gordon and Holden Wolfe claim the 2012 AOY title with consistent top finishes and 1 fish shy of having a limit in every tournament. On the 2 toughest days of the month per the lunar tables with bluebird skies and morning temps below freezing,Larry Barger and Butch Wilson were finally able to add the TOC to their long list of tournament victories. 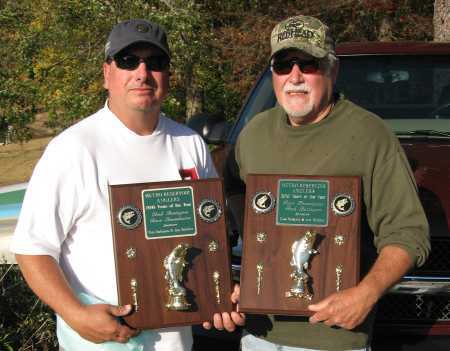 After just missing the title on tiebreaker criteria in 2010, the team of Masaberg and Wisner claim the 2011 Anglers Of The Year. 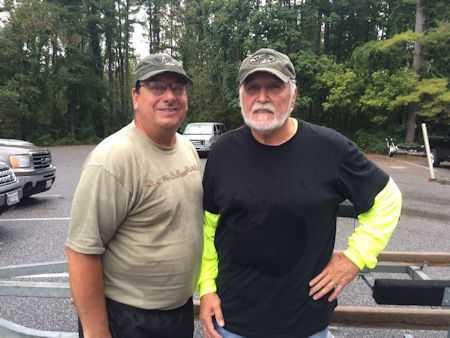 Favored to win and leading after Day 1, Don Kosdemba and Gary Gangi bested the field managing to hold long enough on their deep water spots in a tournament that saw winds averaging 20-30 mph and gusting to 50! 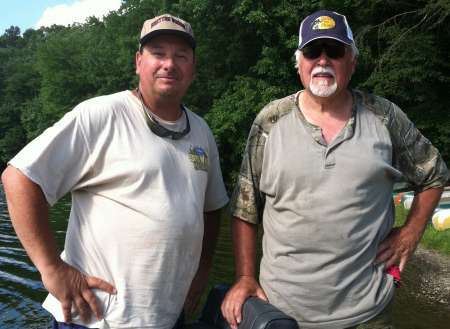 Rob Bertazon and Ron Broadwater win another MRA AOY title but narrowly via tie breaker criteria (total weight). Bertholdt and Gamber comeback to take 2010 TOC at Prettyboy. 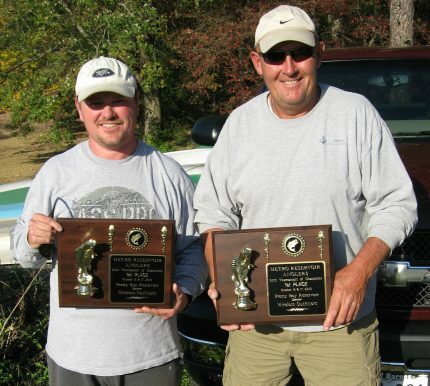 With some resemblance to the 2007 TOC, this time the team of Larry Bertholdt and Mike Gamber stage a dramatic day 2 comeback netting 2 fish late to secure the win. 18 2010 TOC - Bertholdt and Gamber Bertholdt and Gamber comeback to take 2010 TOC at Prettyboy. Last minute heroics lead to victory at Prettyboy! Our final Weekday Warrior tournament of 2016 featured a last minute push by the team of Chad Wisner and Mark Onheiser. With 20 minutes remaining in the tournament Chad and Mark upgraded their bag by an estimated 12 pounds to claim victory. Their 20.36 Lb 8-fish limit included the tournament lunker 4.14 Lb Largemouth. Second place honors went to the team of Don Kosdemba and Gary Ghangi. Don and Gary's 6 fish bag weighed a very respectable 16.00 Lbs. Congratulations to Chad, Mark, Don, and Gary. Thanks to all who participated. 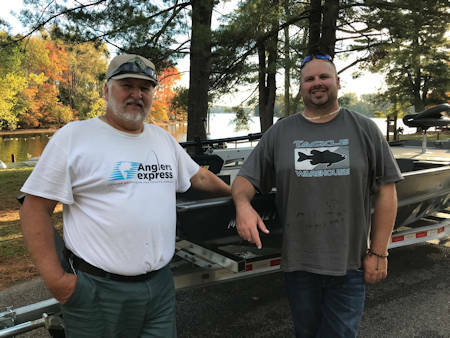 A special thanks to our tournament sponsor, Anglers Express, for providing a gift card for the tournament lunker and a gift card to the last place team. It pays to compete! Read more about Last minute heroics lead to victory at Prettyboy! Our final Weekday Warrior Open Tournament of 2016 will be Wednesday 9/21/16 at Prettyboy. The tournament is open to all, members and non-members. We hope to have a big turnout. This is a great way to have some fun while getting some excellent tournament experience. Tourney hours are 7:00 AM to 4 PM. Please be in the water by 6:30. Entry fee is $80 per team. 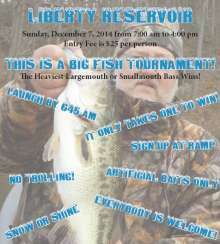 This is an artificial lure only tournament. All boats must have a working livewell. Cooler livewells with aeration are acceptable. Register at the ramp on tourney day. Record shattered by Elliott & Rini!!!! 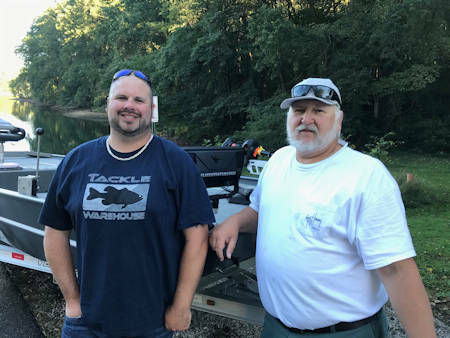 The team of Matt Elliott and Victor Rini shattered the previous record for largest catch with a bag weighing 35.14 Lbs., at our Liberty Reservoir tournament 9/17/16. The previous record of 32.90 Lbs. was caught at Prettyboy Reservoir by the team of Waino Anderson and Ron Wolfe. That record remained uncontested for more than 13 years. Matt and Victor took first place in the tournament and also claimed the largemouth lunker prize with a 5.52 Lb largemouth. 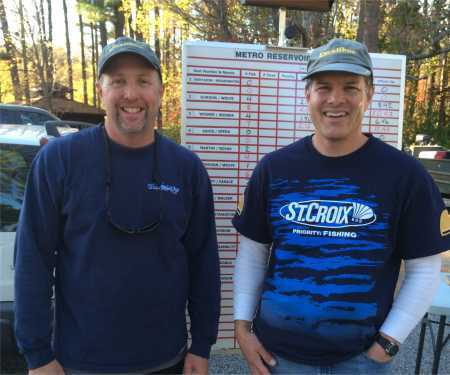 The team of Chad Wisner and Leonard Wisner took second place with 25.57 Lbs. Third place went to the team of Waino Anderson and Ron Wolfe with 21.34 Lbs. Waino and Ron also won the Smallmouth lunker prize with a 3.19 Lb. smallmouth. Congratulations to all competitors. Read more about Record shattered by Elliott & Rini!!!! Our fourth tournament of the 2016 season was, by all accounts, a tough one. Prettyboy Reservoir handed all of the competitors a real test of their abilities. Emerging as the champions of this challenge was the team of Waino Anderson and Ron Wolfe. Their 17.91 LB limit included the tournament Largemouth lunker weighing 3.49 Lbs. Second place honors went to the team of Craig Gordon and Holden Wolfe, with a limit weighing 15.67 Lbs. Craig and Holden also brought in the lunker Smallmouth, which weighed 2.81 Lbs. 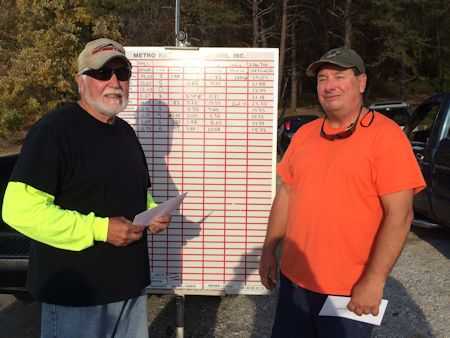 Rob Bertazon and Ron Broadwater claimed third place with a 13.17 Lbs limit. Congratulations to Waino, Ron, Craig, Holden, Rob and Ron. Great effort! As always, thanks to those who helped with the registration and weigh in. This help is greatly appreciated. Our next club tournament will be at Liberty on Saturday 9/17/16. Our next Weekday Warrior Open will be held at Prettyboy Reservoir on Wednesday 9/21/16. We look forward to a good turnout. Read more about Prettyboy Tournament was a challenge! The Weekday Warrior Open at Liberty Reservoir on 8/10/16 was a challenging event, with only 4 limits brought to the scales. 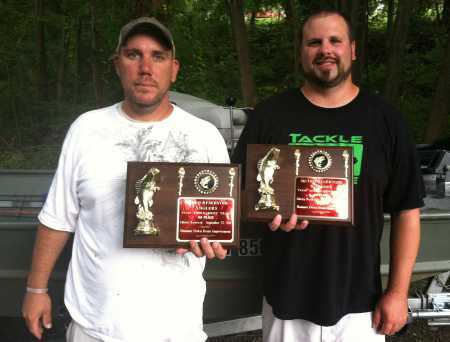 The team of Chad Wisner and Mark Onheiser took 1st place with an 8-fish limit weighing 16.58 Lbs. Their limit included the tournament lunker, a 5.05 Lb largemouth. 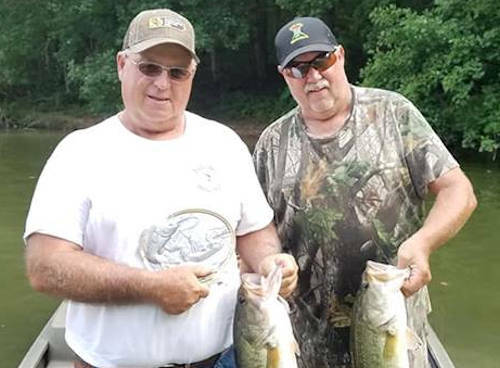 The team of Ian Walker and Larry Bertholdt claimed second place with an eight fish limit weighing 13.71 Lbs. Thanks to all who participated. We hope to see all of you at our next Weekday Warrior Open on 9/21/16 at Prettyboy Reservoir. Thanks again to Anglers Express for providing additional prizes to the top two teams. MRA Members receive corporate discount pricing at the Timonium MD Batteries Plus store when they show their membership card. 2018 Season Sets a New Standard for Excellent Fish Care!